The FA Cup Final is one of English sport’s biggest days, and the BBC’s Match of the Day Live coverage of Arsenal v Chelsea drew an audience of nearly 8 million viewers. To build the excitement and kick off the programme, BBC Sport commissioned a short, fun film that highlighted some tongue-in-cheek outcomes of victory and defeat for each side, including renaming Arsenal’s stadium and the Queen decorating Buckingham Palace in Arsenal red. The film was produced in-house by the BBC but dock10 was chosen to provide a series of key sequences that demanded specialist expertise in high-end Computer Graphics (CG). Working to a detailed brief that outlined each shot and its role in the film, a team of dock10 CG specialists explored the best ways to create the sequences. This involved using a combination of cutting-edge compositing software and 3D modelling to carefully craft each shot. 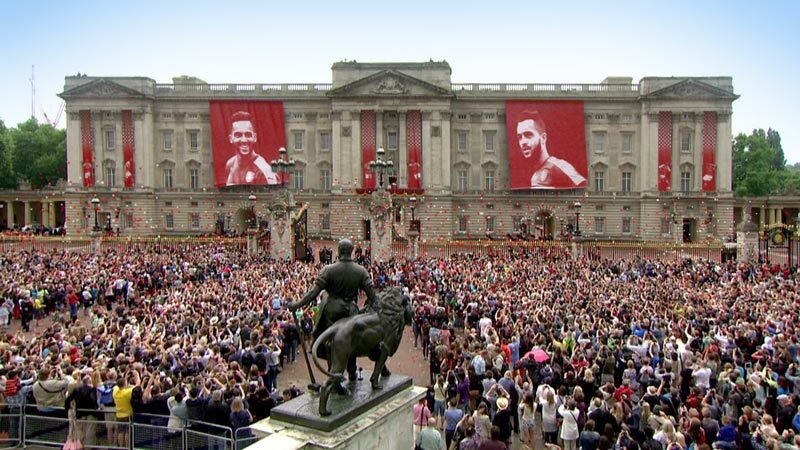 Stock footage, for example of Buckingham Palace, was wiped and had suitable VFX added including Arsenal flags created in 3D to give the impression of natural movement as they were realistically unfurled. Other sequences included putting Michy Batshuayi on the cover of a magazine, creating a statue of Eden Hazard, a spoof ad for aftershave, a movie poster, and renaming the Arsenal Stadium after Alexis Sanchez. The composited sequences were supplied to the BBC who edited them into the final film. Having worked extensively with BBC Sport on a number of projects, our strong relationship and intuitive understanding of their requirements were crucial in putting together these complex CG sequences in the seven-day timeframe. This ensured that the BBC could edit them into the final version in time for the hard deadline of FA Cup Final.